After you have decided to make a car wash your new business venture it is important to do the research and prepare the business plans to make that new business a success. One of the most important parts of a car wash operation is the use of car wash coin meters. Whether your operation is a coin meter or a bill meter, the self-service capabilities make your business an efficient and profitable operation. These meters along with the high pressure washers and pump stations allow a smooth operation with little human intervention. It is a great business that is easily expandable. With a great location, you can count on your new business turning a profit in a short period of time. There are many other factors that affect your daily operation, but the right marketing strategies can make the business work for you. Consider other factors besides location, such as climate, competition, and population. Research is the key to managing, developing marketing strategies, and placing your business in the best location. The car wash coin meters are well made and are very sturdy for a busy operation. They are stylish, but very functional and dependable. These meters can be coin operated or accept bills. The convenience provided with these meters allows customers to drive through the automated car wash facilities within a matter of minutes and the business does not require a lot of overhead, saving you even more money. The car wash coin meters are capable of accepting less desirable or damaged currency and can easily be adjusted for foreign currency. You can depend on getting excellent service for your small investment. These meters are made to last for a very long time and parts are easily exchangeable. With the economic changes and environmental concerns, a car wash operation can still be a profitable business. 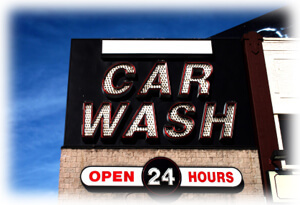 Many car wash operations have used the new recycling techniques along with the car wash coin meters and pressure washers to successfully manage their businesses and make them more efficient. The drought conditions in many parts of the country have brought about a change in how the car wash business operates. Incorporating more high efficiency equipment, less human intervention, and the recycling of water is a sign of the times. This equipment can help you to develop a thriving business. When customers obtain the end result they are seeking, your operation can definitely be a successful one. Using the right types of equipment that work collectively to deliver consistent results can be realized. Develop a great business plan that will help you to realize the potential of a great business venture that uses state of the art equipment including that of car wash coin meters, pressure washers and optimum pump stations. Add sleek design, ease of use, and low pricing and you have got a winner. Only a small investment amount is needed to begin your successful business. The equipment is also reasonably priced and easy to operate. Less overhead and less human intervention means less headaches for you and your car wash coin meters play a huge part in giving you peace of mind.